Cross-cut and slotted wash sponge cleans every nook and cranny! The Lake Country Wash Wedge is an ingeniously designed gold foam wash sponge that features cross-cut and slotted grooves for safe, effective dirt removal. Constructed entirely out of premium gold foam, Lake Country’s softest foam, the Wash Wedge pampers your vehicle’s delicate finish to ensure the paint remains swirl and scratch free after every wash. Comfort-grip neoprene foam handle makes the Wash Wedge easy to hold on to, even with soapy hands. Why didn’t I think of that? is what comes to mind the first time you use the Lake Country Wash Wedge. The entire face of the sponge features cross-cut and slotted grooves that help remove dirt and keep it trapped deep within the sponge and away from your paint! 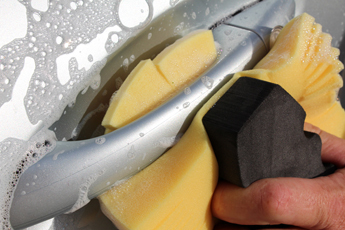 The cross-cut and slotted grooves make the Lake Country Wash Wedge the most effective car cleaning sponge available. 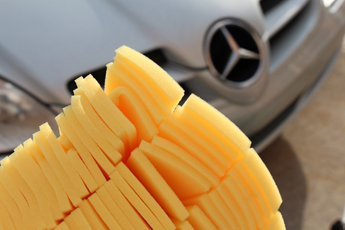 When pressure is applied to the sponge, the gold foam tabs flex and spread to fit in between body panels, behind door handles, and grille slots, cleaning where no other wash mitt or sponge could ever reach. The Lake Country Wash Wedge holds a ton of soapy water, providing ample lubrication for the sponge to glide effortlessly across the surface. The cross-cut and slotted grooves conform to sharp body lines and creases, ensuring every square inch of your vehicle is cleaned. 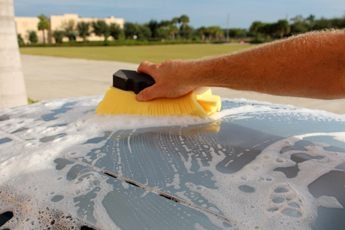 Use a separate Wash Wedge to clean intricately designed wheels – you’ll wonder how you ever washed your vehicle without it! Like other detailing accessories manufactured by Lake Country, the Wash Wedge is built to last. From the dense gold foam to the sturdy neoprene handle, the Lake Country Wash Wedge will provide years of safe, swirl-free washing. Works great as all the dirt gets trapped deep down inside the groves verses sitting on the surface of the sponge and scratching your vehicle ! Love it. 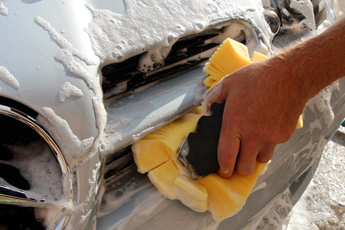 Still to cold to wash my truck,but this sponge is big and feels great in your hand. I purchased this with hopes to speed up my wash, as well as eliminate the potential for dropping my wash mitt. This "wedge" has a very nice handle to grip while using, and if you do drop it, it's easy to clean. It holds a lot of water/suds and is great for cleaning in grilles, behind/around door handles, mirror mounting points on the body/doors, and anywhere else your basic microfiber was mitt cannot reach. so far, so good. ConsMight be delicate, as one of the foam pieces is already nearly split in half. This was an impulse buy to go along with the foam gun I was ordering. No regrets! I've always used mitts but no more. There is no doubt this thing works better. I wash my cars a lot, when this one wears out I will order another one. ProsLittle foam fingers work great for getting into grills, around curves, and into every little crevice.